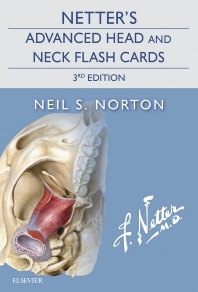 Netter's Advanced Head & Neck Anatomy Flash Cards are the perfect portable study tool for quizzing yourself on key anatomic structures and clinical conditions of the head and neck. They accentuate the clinically relevant anatomy through beautiful Netter illustrations and new artwork in the Netter tradition, making for a fast and fun review at any stage of your healthcare career. Cards are cross-referenced to the parent text, Netter's Head and Neck Anatomy for Dentistry, 3rd Edition, and include much of the new art from the textbook. Beautiful, well-known Netter illustrations accentuate the clinically relevant anatomy. Feature an image and numbered labels on one side, and label answers and comments on clinical and anatomic relevance on the other. Set includes additional Imaging, New Art, and Clinical Correlate cards. Perfect for quick, portable study for head and neck and dental anatomy courses. Allow you to quiz yourself on key anatomy terms and test your knowledge of classic presentations of disease.